South Coast Roof Training Ltd is proud to be an affiliate member of the NFRC. The two Lucky Draw winners from the SCRT Open Day have already undertaken their prizes – the winner spent 5 days on a Lead Welding and Bossing course, and the runner up spent 3 days on an Upskilling course. The new Heritage Skills NVQ Level 3 Diploma SUP (Specialist Upskilling Programme) is currently under way, and the candidates have worked on recording a random sized slate roof, stripping the slates, learning the mysteries of the gauge stick, and then battening the training rig in preparation for random sized slating. There are two cohorts on the CITB Apprenticeship Diploma course at the moment. 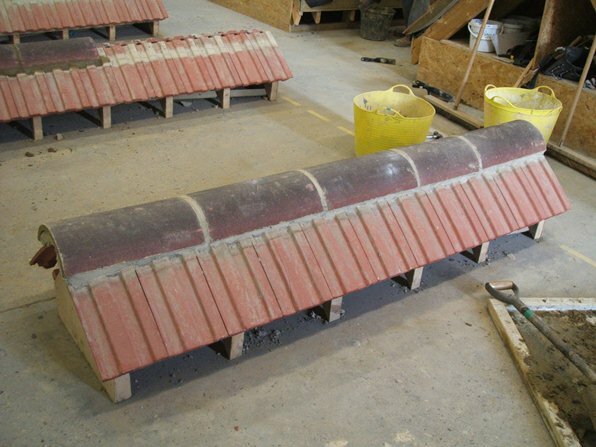 One group is working with interlocking tiles and forming open valleys; the second group is using sized natural slates and forming open valleys. The Foundation course is working on the ridging rigs, and even after just a few sessions on the course, they are improving and growing in confidence.